Coordinate math games with holidays to make learning extra fun! Here is a Valentines Day game that uses red hearts, red beans, and red dice. We at Kids Activities Blog hope that your child will love this counting game as much as we do. Valentine’s Day is a great time to count up all the people that you love. 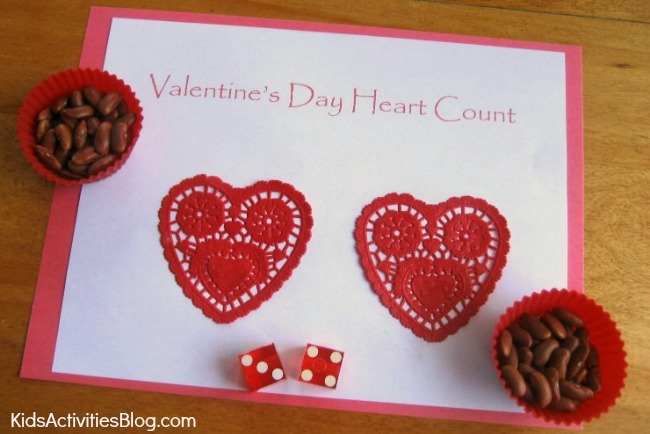 It is also a great time to practice counting with symbols of Valentine’s Day. 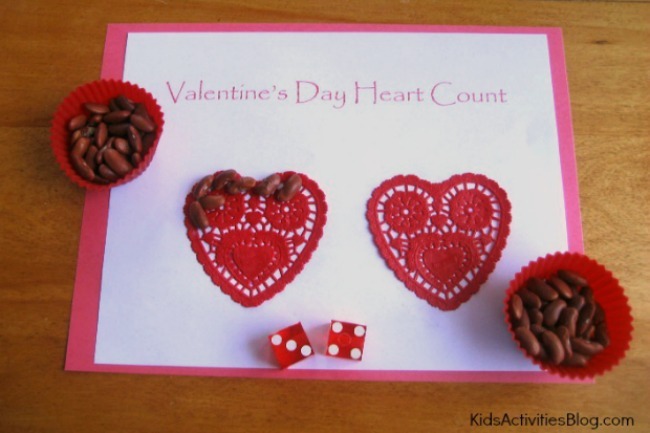 Red beans, red heart doilies, and bright red dice are great tools to use when counting. The red beans are wonderful counting tool. They are easy for small fingers to pick up and grasp. They are so very reasonable to purchase at the store to use for this activity and many others. The red heart doilies are a great a work space. They can can be glued on to a piece of paper with a game title on it or just placed on a table to work with. The pair of red dot dice are easy for children to count or add up. Older children might have greater challenge by using dice that have numbers instead. When he filled his heart with beans, my son remember to shout, “My heart is full!” Yes, he won the game. I guess I will need to have a rematch so, I can shout, ” My heart is full!” too. Tip: If you are playing this game with young children, you may want to work with only one die. It will make the counting a little easier for them. Thank you for linking up in our Crafty Showcase last week. We love it when mom’s make education fun!